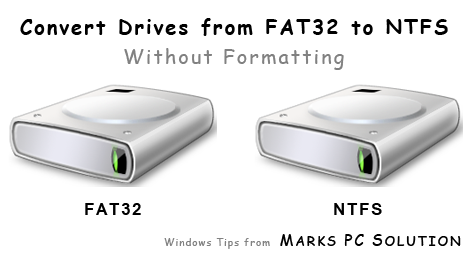 Often you may need to convert your hard drives from FAT/ FAT32 to NTFS. If you have to convert all drives of your PC, then it will be really difficult for you to back up your files. Because, in order to convert drives, you have to format it. And in that case you may need to set up the whole computer. But there is an easy option for you to do this job. And you don't need to format your drive. Even you don't need to back up your files! msg %username% NTFS Converter: Presented by www.markspcsolution.com! Look at the drive list. I've used C, D, E, F, G, I, K. If your drive letters are different just make change in the drive letter. And if you need to omit something, just delete it. Suppose, if you need to convert only C Drive then you don't need to write the following lines in notepad. If your desired drive letter is L, then type convert l: /FS:NTFS. By this way you can convert any other drive into NFTS. Note: If you wanna convert from NTFS to FAT32 then you need to format it. So before converting to NTFS, make sure you really wanna do this. Otherwise you need to format the drive to back to the FAT file system.